Let’s hit the trail! 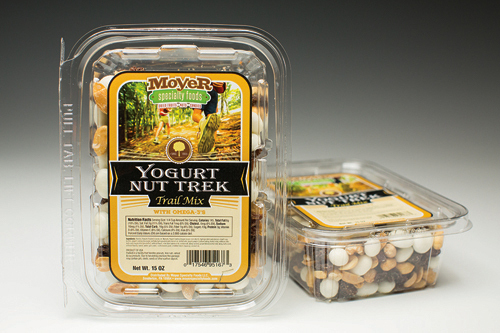 This is a blend with Omega-3’s and plenty of nuts, raisins, and smooth yogurt covered nuts to take with you on the trail or a long journey. Ingredients: Raisins, Peanuts Roasted (canola oil), Walnuts, Yogurt Coating ([sugar (sugar, corn starch), hydrogenated palm kernel oil with soy lecithin, yogurt coating mix (sugar, partially hydrogenated palm kernel oil, nonfat milk, yogurt powder [cultured whey, nonfat milk], artificial color, lactic acid, soy lecithin [emulsifier], artificial flavor), milk blend (whole milk, nonfat milk, whey, lactose), yogurt blend (nonfat milk, whey, lactic acid), artificial flavors], raisins, water, gum arabic, confectioners glaze, modified starch [tapioca], coconut oil).